The Homeplace Working Farm and Living History Museum represents a two-generation farm. When you visit the Homeplace, you will see interpreters in period clothing going about their daily chores. You’ll find the perfect blend of artifacts, restored historic structures, and traditional seasonal activities to step you back in time to relive history before the Civil War. Even our livestock includes rare and endangered breeds. 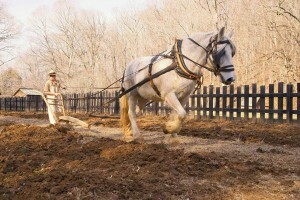 We cultivate many varieties of garden plants and field crops; most from heirloom seeds dating back before the Civil War. These heirloom seeds can be purchased in our gift shop. Walk into the Tool Barn where tools and farm implements are stored. The Tool Barn also doubles as the farmer’s woodworking shop. You may see men splitting rails for fences or busy at the spring pole lathe turning a chair leg. You may even be invited to help with the task at hand. Be sure to stop by the kitchen to experience the heat from the wood burning stove and enjoy tempting smells of hardy country cooking.